March 5th Singer Songwriter’s Announced! 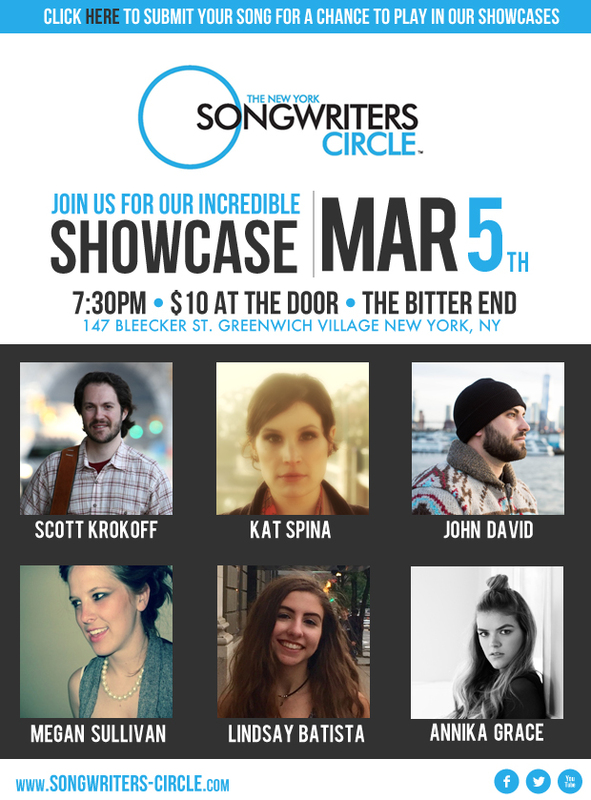 Join us Monday March 5th for our Award Winning Singer/Songwriter Showcase! Katherine Spina – At the heart of it, Kat is a singer. She is captivated by the power of tone and as a writer, thrives on storytelling through the lens of simplicity. Kat is a SESAC member and has recorded two studio albums, Engaging the Muse and Chasing Shadows, and working on a new album set to release this year. Megan Sullivan – Grew up playing the drums. After playing with a band in college, she taught herself the guitar so she could write her own songs. Today, she enjoys writing and recording her own tracks at home, where she plays every instrument on every track. You can hear her full band sound online. Annika Grace – is a singer/songwriter born and raised in California who just moved to the city. She has been writing lyrics and poems since she was young and can’t wait to share her stories with you through her music. She has an EP out ‘Glass Town’ and three singles. Scott Krokoff – New Yorker Scott Krokoff (pron: Crow-Cough) weaves elements of folk rock & country pop into confessional and compelling Americana. He has been praised for his “graceful tales of morality and perseverance” (The Vinyl District). Scott has opened for Elle King, toured in the US and Europe, including playing in Belgium for his biggest fan, and received radio airplay throughout North America and Europe. JD Pinto – is a New York-based Singer-Songwriter whose rich, rapturous melodies are met with an authentic narrative. His soulful vocals over delicate guitar lines are simple, yet steadfast, charming, and emotionally evocative, allowing for the listener to yield themselves to the atmosphere of each song. Lindsey Batista – is 17 year old singer/songwriter from Connecticut. She’s been writing since she can remember, and the circle will be one of her first performances singing original songs.